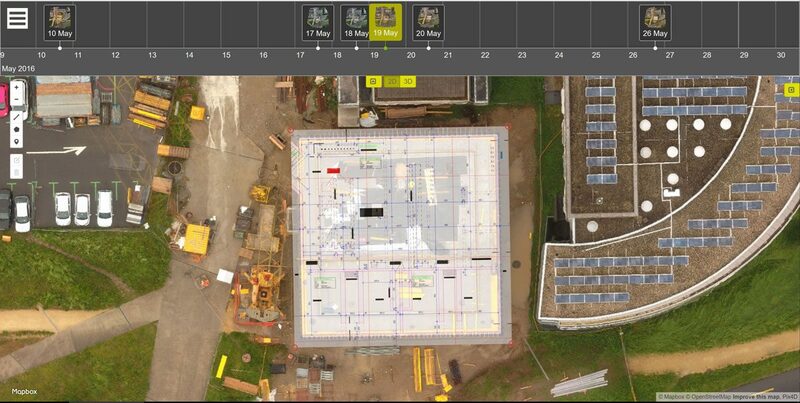 In this interview, Julian Norton, Business Development Manager of Pix4D, talks about the company’s innovative mapping system for construction sites. Pix4D has just launched an early adopter program and is looking for test users. Can you say a few words about your company’s background and mission? Pix4D was founded in 2011 as a spinoff of EPFL, a leading Swiss tech university. The years of leading scientific research in photogrammetry and computer vision done by our founders was applied to drones long before drone mapping became a “thing.” Fast forward through more years of hard work to now, and you’ll see Pix4D specialized in professional drone mapping software to produce orthomosaics, 3D models, digital surface models, point clouds and more, all from images. Our solutions are purposed towards four main industries: surveying, agriculture, real estate and construction. We want our professional clients to benefit from our unique hybrid approach, which combines mobile data capture with cloud and desktop hardware, to conduct mapping in a way that fits them best. What are the best uses for and benefits of visual documentation on the construction site? BIM use is increasing in key in construction projects, and so is the need to control the construction process. This means construction managers want to be more integrated into the entire process and need regular site updates. Regular visual documentation means a comprehensive site overview for daily planning and communication. With permanent visualization, it’s easier to monitor a site and spot errors, problems, or omissions early. Remember that an estimated 15% of a typical construction site’s cost is allocated for mistakes, so by verifying the BIM process and aligning the schedule you get a significant reduction of construction cost and project duration. There are several technologies available for mapping the construction site. Can you give us a short overview of the current situation? After 30 years of experience in the construction industry, I’ve seen a lot of progress in site surveying methods! When I started, traditional survey equipment was used, which couldn’t provide daily visualization. In fact, most of my time was spent correcting errors and fixing problems: I was reactive, but not proactive. Laser scanning solutions changed this by advancing point cloud technology and providing the construction industry with very complete 3D surveys. Drones represent another important step toward innovative solutions and smart construction, enabling effortless remote site visualization. However, we also know that laser scanning and drones mean specialized (aka expensive) equipment, experience, flight permits, appropriate weather conditions and such. Those requirements can rapidly turn into major constraints. The crane camera system overcomes such issues. You have introduced a crane camera system that’s cloud-enabled. Can you tell us what it does, what it is composed of, and how to use it? First and foremost, our tower crane camera system is an automated and non-intrusive solution. Produced in collaboration with Liebherr, one of the world’s largest manufacturers of construction machinery, it is mounted on and powered by a tower crane. The camera captures high-resolution images automatically, offering a complete aerial overview of the site. While the crane completes its normal operations, camera sensors detect movement and start the data collection. As soon as enough data has been captured, it is wirelessly transmitted to the Pix4D cloud via Wifi or a SIM card to be turned into 2D maps and 3D models. Deliverables are easily analyzed and shared once they’re on the Pix4Dbim cloud; anyone who needs to review the current site status can remotely access the results. Advanced editing tools are also available using Pix4Dbim on desktop. Who should be interested in your system and what are the main benefits that it offers? The system is a perfect fit for construction managers, as well as BIM, CAD or VDC managers. Image capture, transmission and processing is fully automatic and on demand. No human intervention is required, and cost is low. Site status can be visualized daily via our online platform, and both legacy data and results are remotely accessible and easily shared for better collaboration. All these advantages make the crane camera a perfect monitoring solution, one we strongly believe is a game-changer for construction and that will revolutionize site data capture. You’ve launched an early adopter program. What’s it all about and how to enrol? We wanted to develop an exclusive testing program before we officially release the crane camera solution, to challenge it through a representative number of construction professionals. So we are offering fifty customers first access to a free prototype camera, to be installed and tested on their site, in exchange for feedback of the system. Those users will also benefit from access to our Pix4Dbim cloud and desktop software solutions. Our primary goal with the program is to make sure the system works in all sorts of environments and conditions. Feedback is essential to also ensure the perfect crane camera integration with our software developments. Construction professionals can apply to our Early Adopter Program by filling out the contact form on our website (click here). Pix4D is one of the market leaders in drone mapping software, and we benefit from strong software capabilities and position. One of the reasons for this is the company background in research and innovation. We’re not going to stray from that; our focus will remain on continuous development and solution enhancements, as well as market evolution. We don’t just think about “products,” but about complete solutions that fit our professional user’s requirements. I believe 90% of construction value lies inside of the projects, meaning this is also where the mistakes can happen. With this in mind, the next step for Pix4D is to capture data from the ground and not just from the air. We want to provide construction professionals with integrated solutions that combine drone technologies and flexible camera systems for more BIM value. Where can our readers find more information on Pix4D? On our website, www.pix4d.com/construction, and blog https://pix4d.com/blog/ for use cases.